Painted woodwork conceals some flaws, and reveals others. Notably, it will reveal poor painting skills. 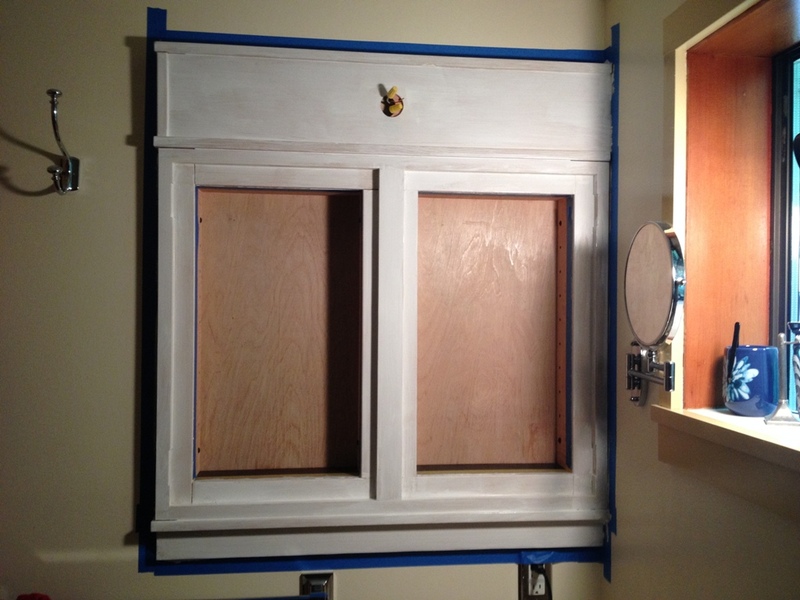 I’m not a big fan of painted cabinets, I suppose not many woodworkers are, but in this case they fit in with the existing design. With painted cabinets, you can use lower grades of wood, but you still can’t go too cheap because you need a smooth surface and you need sharp corners where you make your cuts. Even painted, any tear-out or splintered edges will be obvious flaws. And if your holes and gaps aren’t adequately filled, they will forever be a glaring defect that everyone will see. So you still have to take care even if you’re going to paint what you’re building. 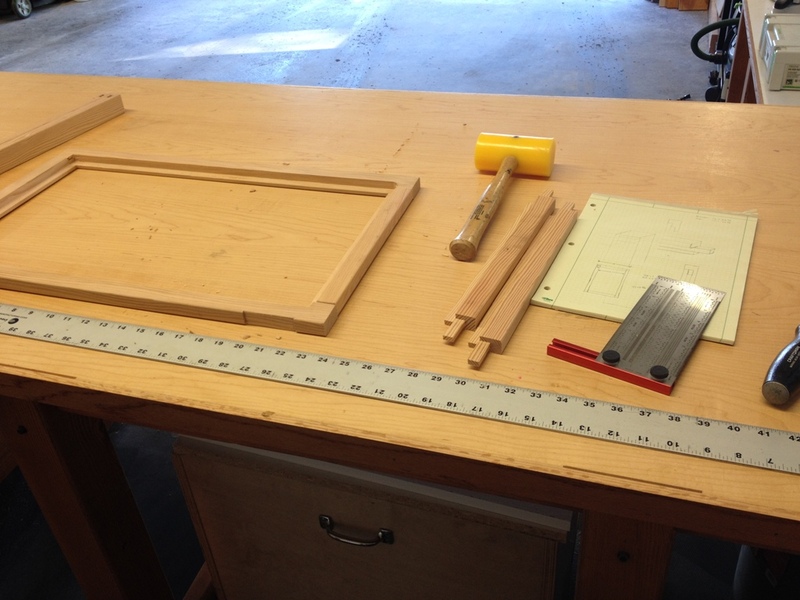 The door frames are pretty narrow (1 1/2″ wide), and as such I felt the need to join them by mortisse and tenon. They need all the strength they can get. 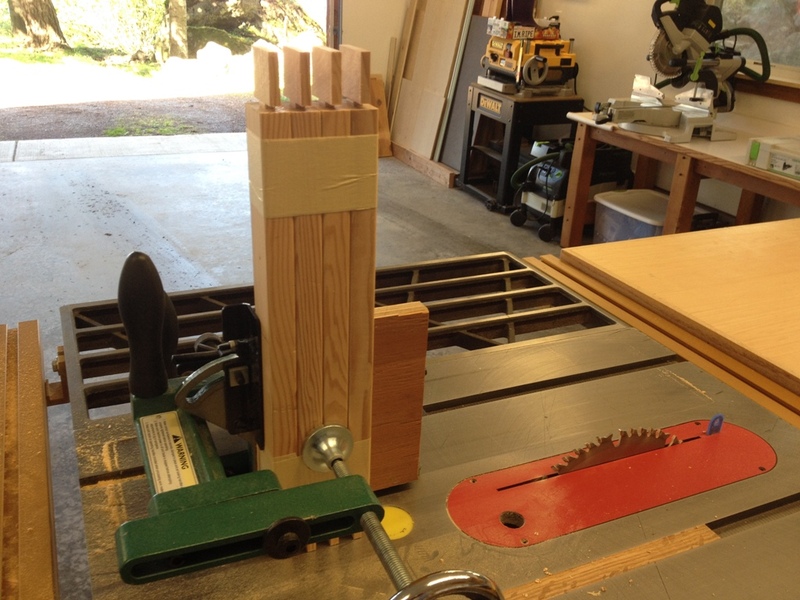 So, above is a pic of me cutting four tenons at once. I taped all four pieces of wood together so they all fit in the jig, and in one pass I made the exact same cut on all four pieces of wood. 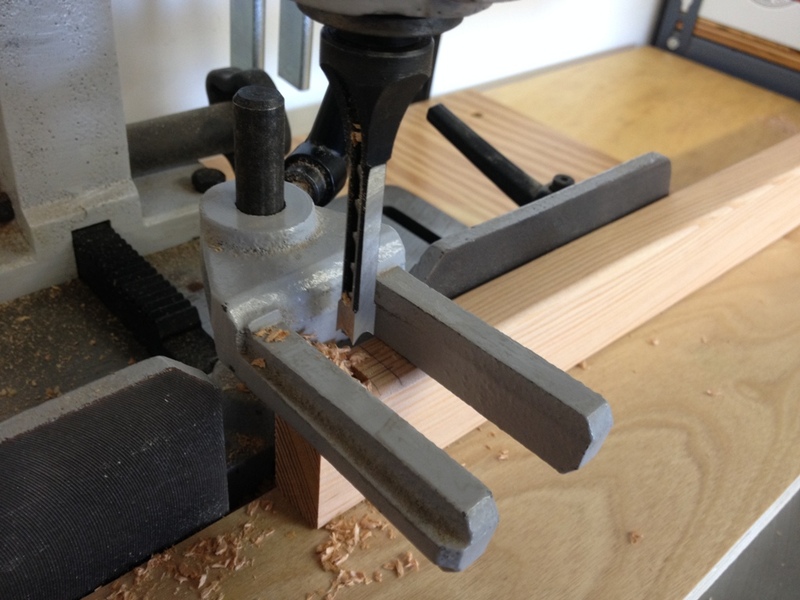 This may seem foolishly dangerous, but these pieces are so small that they would not fit into the jig one at a time. Normally when they’re this small I’d just hand cut them, but this seemed to get the job done. Here’s the frame being assembled. Note the absence of blood; I haven’t lost any fingers yet. I had to cut out a groove for the mirror. 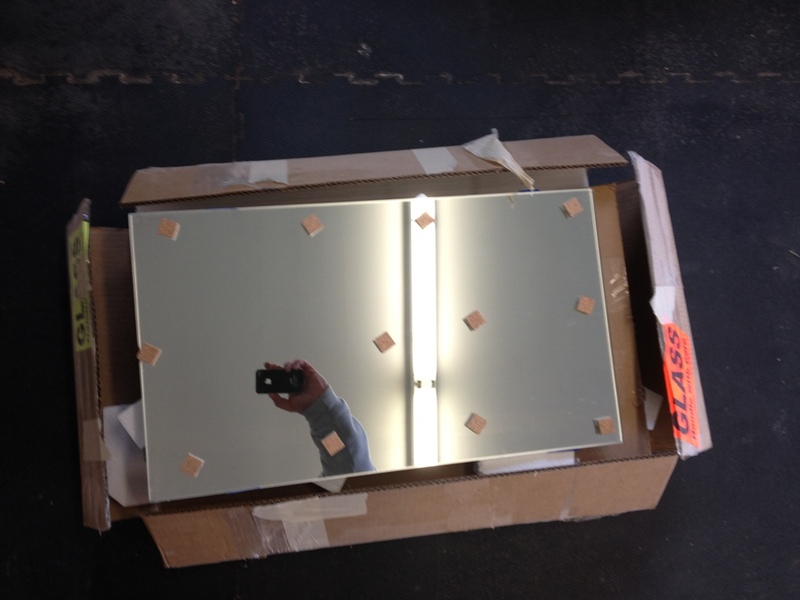 The mirrors are 1/4″ thick glass. I think they’re stronger than the frame I’m putting them in. 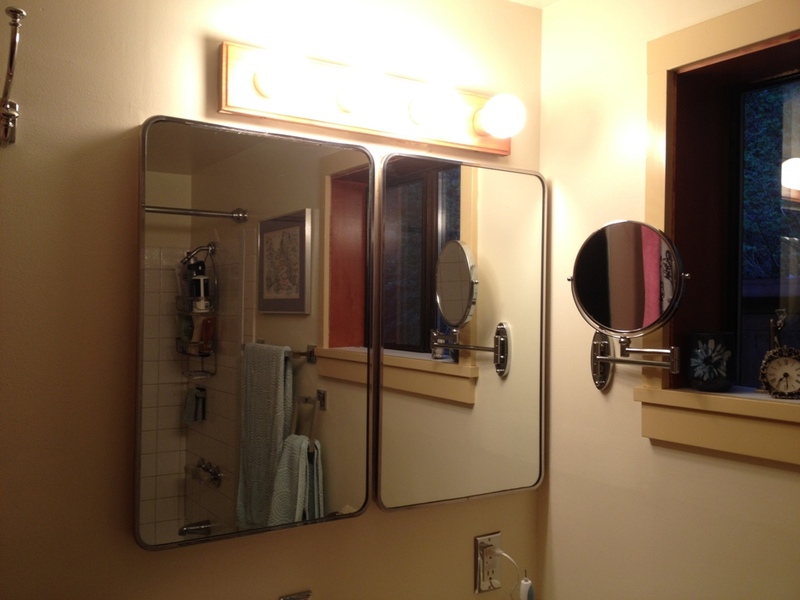 I’ve had these mirrors over a year. They’re finally going to have a home. The fit is great. 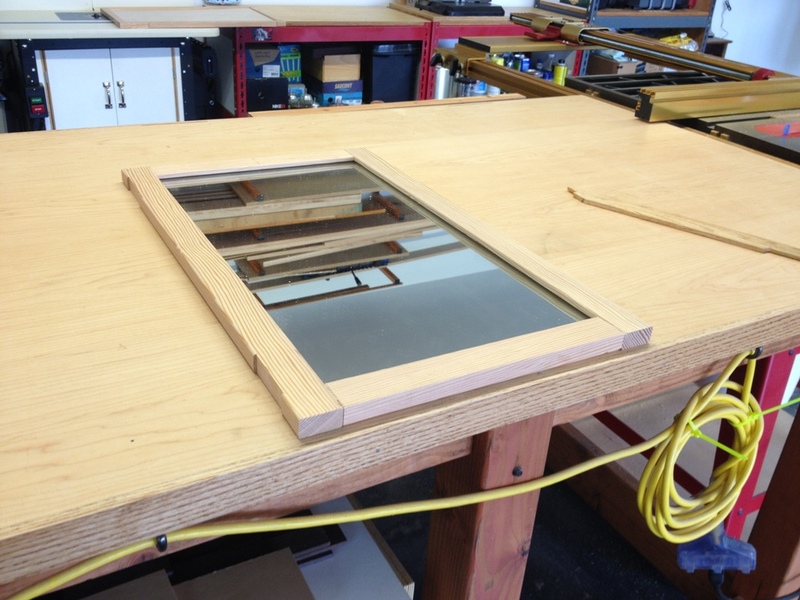 About 1/16″ between the glass and the wood. 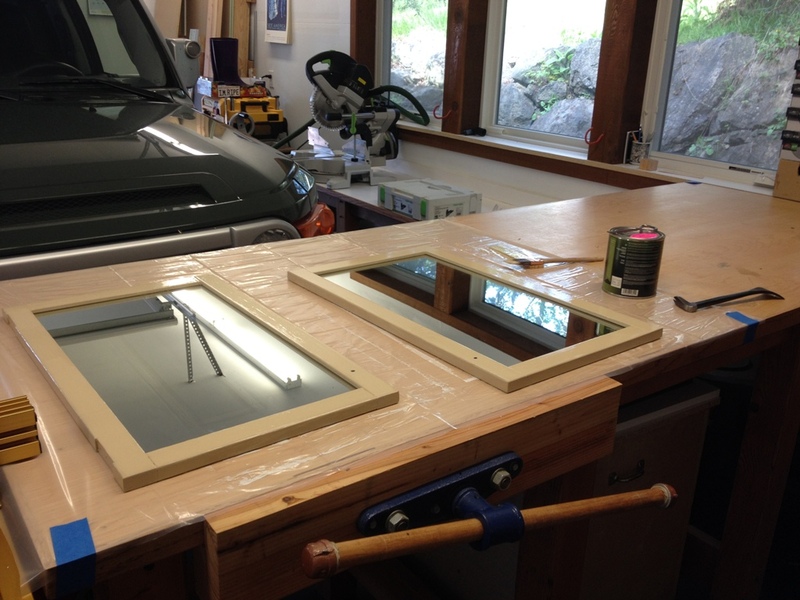 I’m going to put a bead of silicone gel around the inside of the wood frame and just rest the glass onto it. 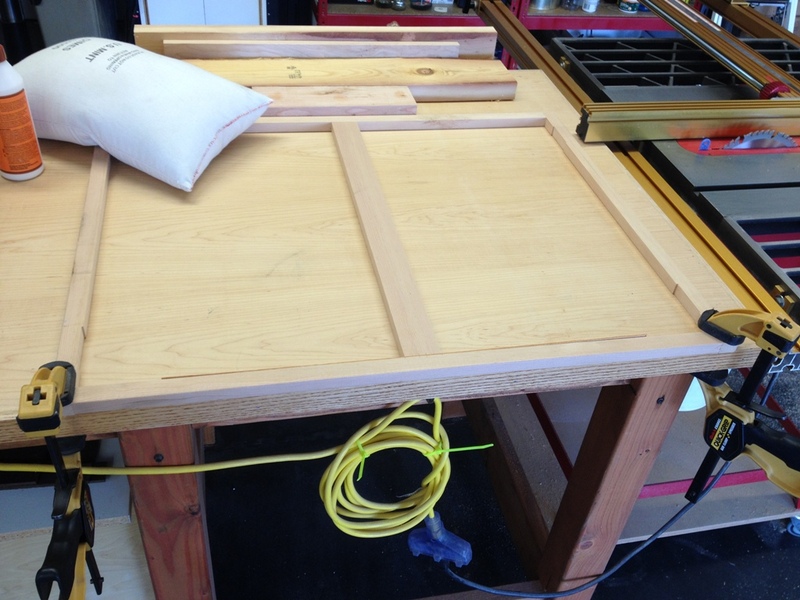 I have some plywood backings that will go onto the back of the glass. 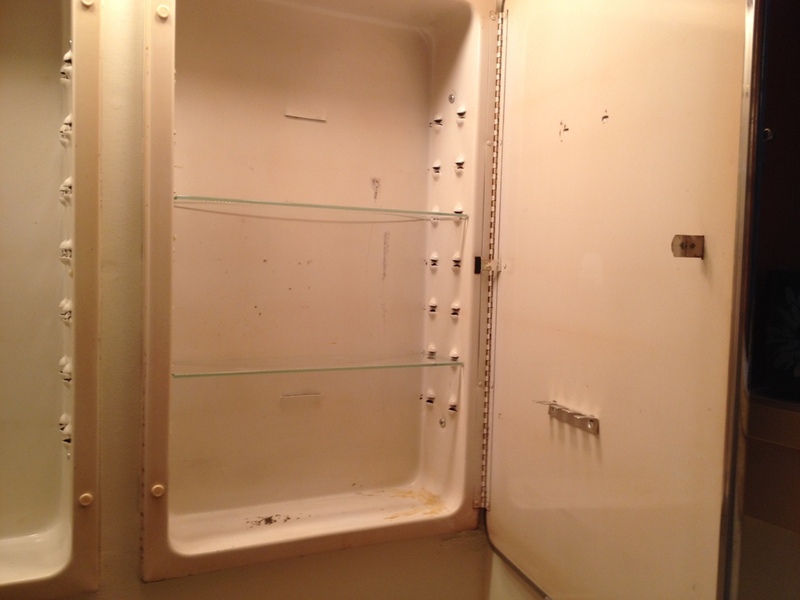 This should be a really solid door for a medicine cabinet. Now I’m just waiting for the paint to dry. 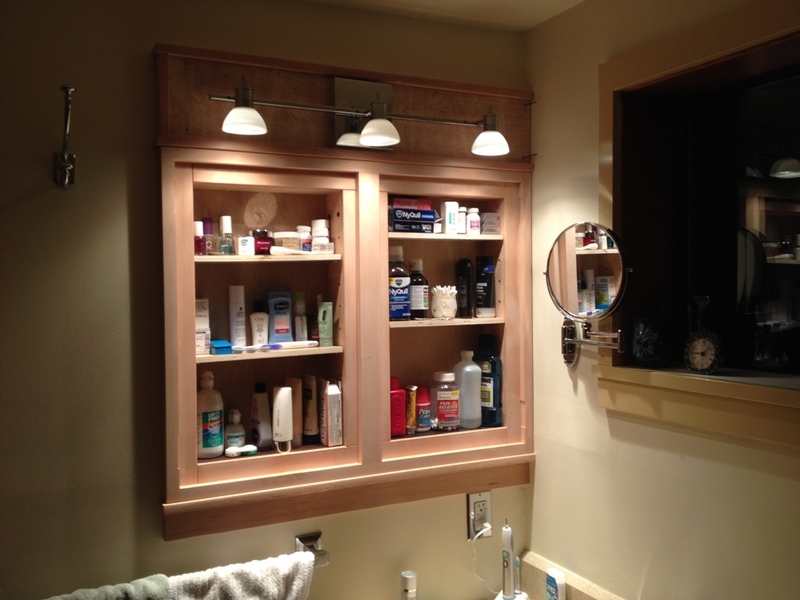 Do you want to see some ugly medicine cabinets? I’m warning you, these are bad. Wasn’t kidding, was I? Poorly fitted contraptions of stamped sheet metal, rusting in too many places to adequately fix, that look like they belong on a tug boat that takes barges to Severodvinsk every three months. I suppose they’re nostalgic in a way. When I arrived, on my first night here in the house, that light fixture had three of the only four working lights on the entire property. Do you want to know how many places are open on Orcas Island at night that sell light bulbs? 0. So, yeah, I’m thankful for that old light fixture so I didn’t have to go to the bathroom in pitch blackness in a strange house. I’m quite fond of them…. NOT. It’s at the dump now. Good effing riddance. I hated that thing. The cabinets too. I would have thrown knives at them but, you know, seven years bad luck and all. I drew up full plans to build new cabinets about one year ago, and they’ve been sitting (like many plans I draw) and waiting for me to start cutting wood. I had a full cut list, dimensioned drawings from every angle, and even a materials itinerary of all the hardware and woodware I’d need. 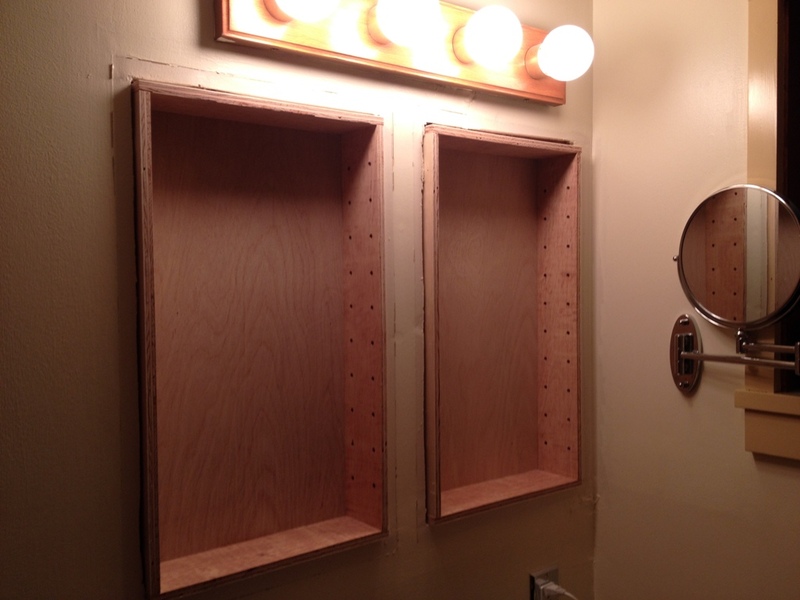 I bought the hinges, the knobs, the little metal pegs that go into the holes that hold up the shelves, I even bought the custom cut mirrors !!! all about a year ago. This is one very procrastinated project. In my defense, I’ve been a little busy. 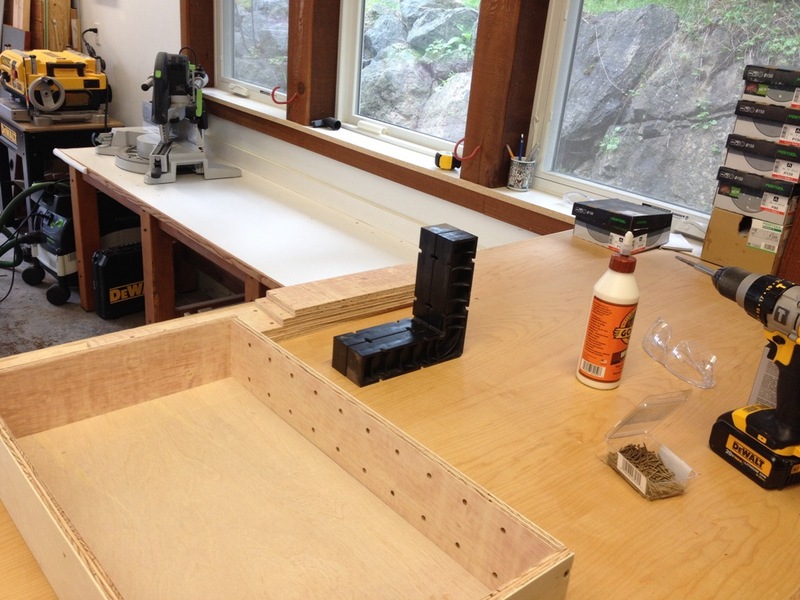 I constructed the two boxes to exactly the dimensions that I had measured a year ago and they fit PERFECTLY! How often does that happen in a woodworker’s lifetime? Not often, for me at least. Once I knew they fit into place, I could start cutting the inner frame. 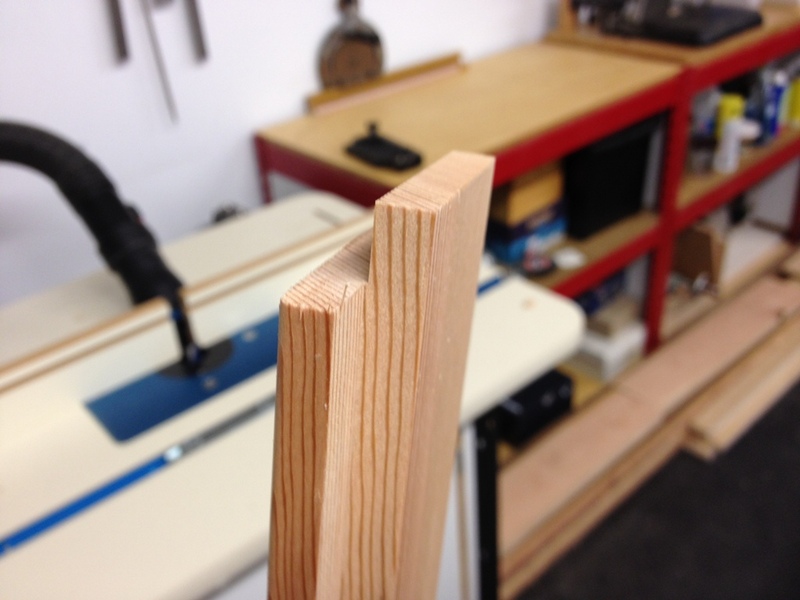 Everything is going to fit together with lap joints, like the ones shown above. Nothing too fancy, just what works. I’ve had these pieces of wenge, which is an African hardwood, just lying around from another unfinished project from long ago. I’ve probably had them for about ten years. Finally found a use for them, they are going to be the shelves and bottoms of my bathroom cabinets! Hooray for them. I used to think of wenge as a poor man’s cocobolo (a central American hardwood) but since then the price of wenge has increased. I only need a couple more pieces. There goes my play money for the month of April. 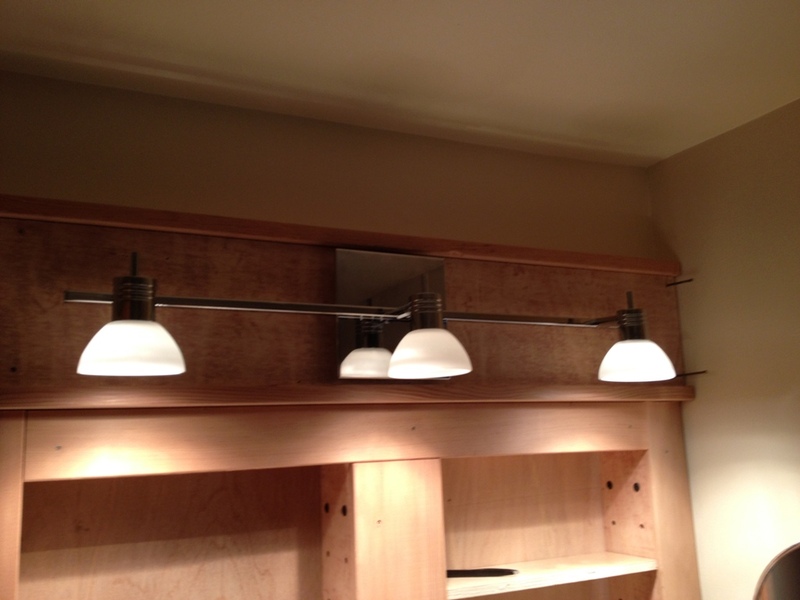 And yeah, I bought that light fixture about a year ago too. It’s simple and it works well for the room. I’m not terribly happy with the housing I made for it, I may have to re-do it at some point. 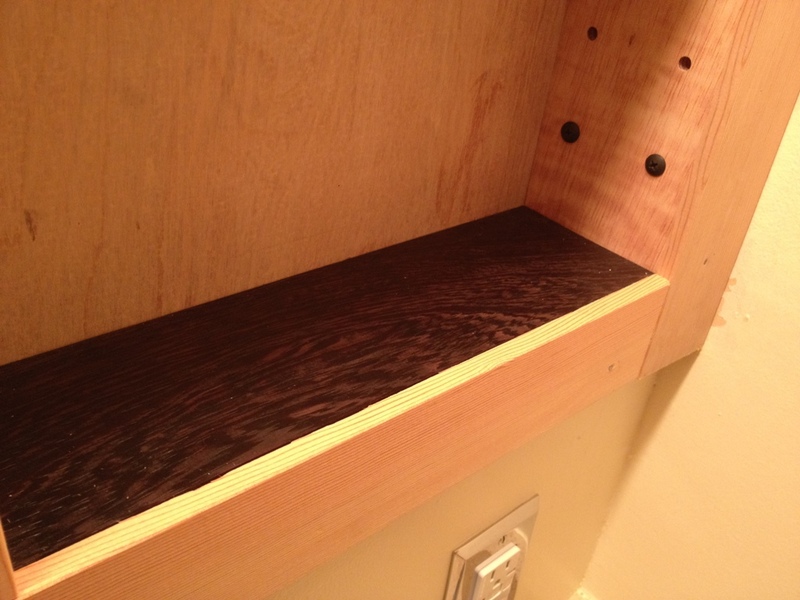 I intend to paint these cabinets, which will conceal a lot of defects, but I’m still not happy with this top part. So after the boxes were framed in it was time to construct the outer frame that goes atop it. 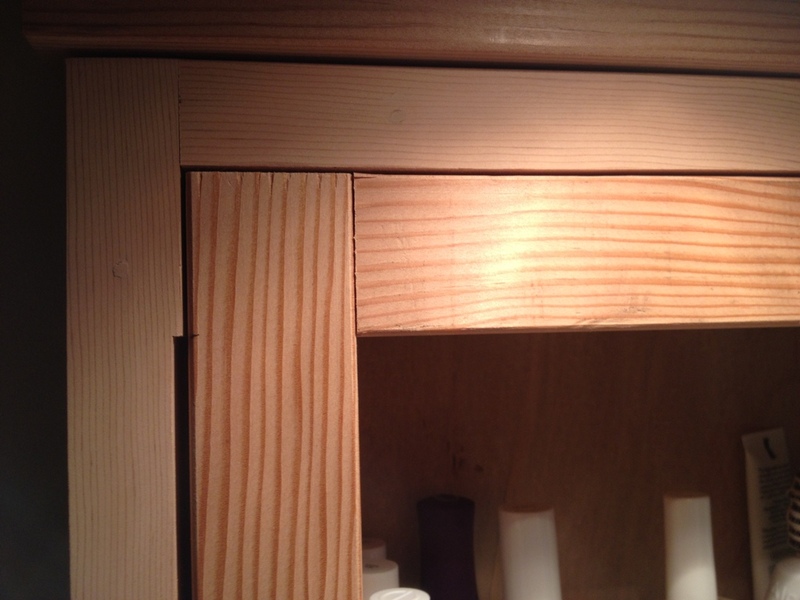 The cabinet doors fit into this part, so it needs to be Perfectly Square and Flat. 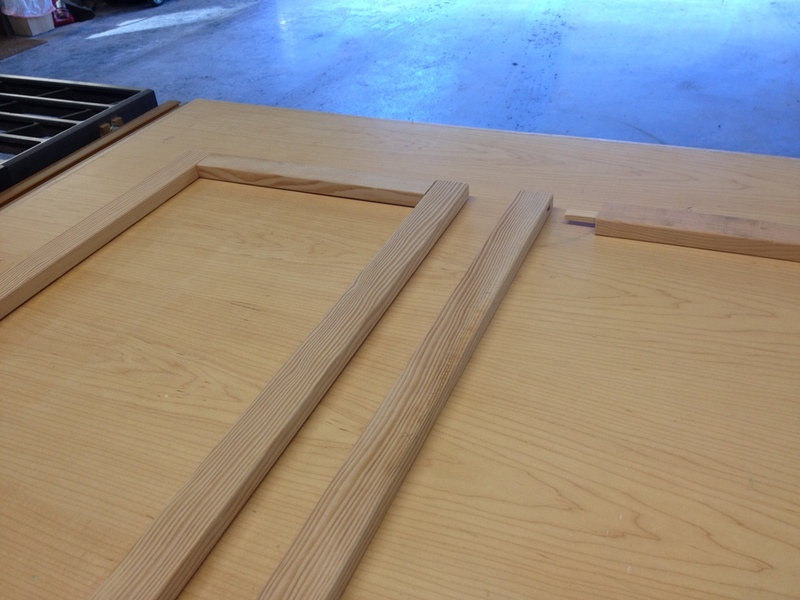 Lots of clamps and sand bags went into the making of this frame. Some people get all offended if you look inside their medicine cabinet. Here I’m posting pictures of it on the internet! Look all you want! There’s tylenol, nyquil, deodorant, mouthwash, all sorts of embarrassing things in there. But I know you just came here to see the awesome cabinetry and how well that frame fit into the wall. Looks significantly better than the old Severodvinsk-bound cabinets. Oh crap, I forgot to make cabinet doors. Well, I guess there’s next week.